This guide is almost exactly the same as our guide for taking screenshots on your Droid 1 without rooting, but wanted to make sure all of the new Droid X owners out there knew the process. The tutorial we’ll walk through will first of all help you install the Android SDK which enables you to perform all kinds of fun without being rooted. The most most important though, might be the ability to take shots of your beautiful home screens. Follow the entire process after the jump! 1. First thing we need to do is download both the Android SDK which is compatible with your operating system and the Java SDK. 2. Once they have finished downloading, go ahead and install the Java SDK. 3. Then unzip the Android SDK into a folder you will remember later. 5. 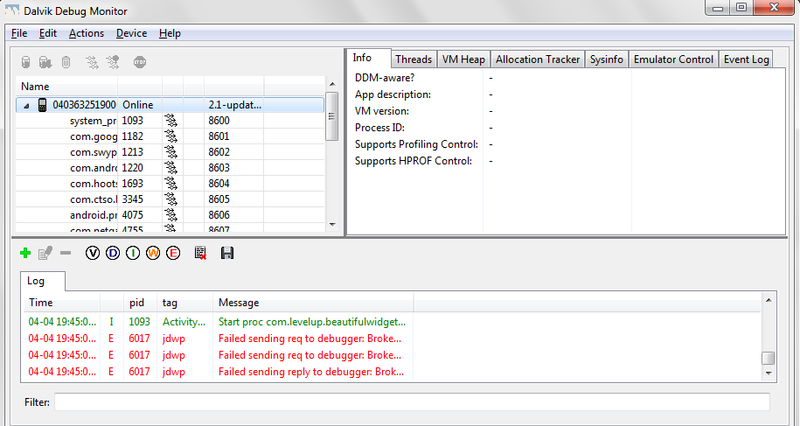 Head back to the folder where you unzipped the Android SDK, look for the “SDKSetup.exe” and run it. 6. When the setup opens, you will be prompted with “Choose packages to install” at which point you can choose which APIs and other software you want to install. The most important package you need to install is likely at the bottom and should be titled “USB driver package.” Make sure to “accept” that. At this point you can also start unselecting unwanted packages, but should probably keep the 2.2, 2.1 and 2.0.1 APIs. 7. Click “install” and allow for whichever APIs you’ve selected and the USB driver to download and install. 8. Once everything has finished, go ahead and connect your Droid to your PC via USB cable. 9. If for some reason your Droid is not recognized by your computer, you now have the USB drivers ready for installation in the Android SDK folder you unzipped earlier (called usb_driver). Please move forward with USB driver installation at this time if you need to. The rest of you can go forward to step 10. In Windows, click start, right click on “My Computer” and choose “Manage.” Choose “Device Manager” and you should see your Droid X listed. If there is a question mark over it, right click on it and choose “Update Driver.” Navigate to the location of the USB driver you downloaded with the SDK. Choose the folder it’s located in and select OK. If for some reason that USB driver doesn’t work, try this one. 10. In your Android SDK folder, open the folder titled “tools” and look for “ddms.bat”. 11. Open “ddms.bat” and wait for your phone to connect. You’ll know it’s connected when the “Log” starts becoming populated with info. Clicking on the listed device under “Name” will also connect you. 12. 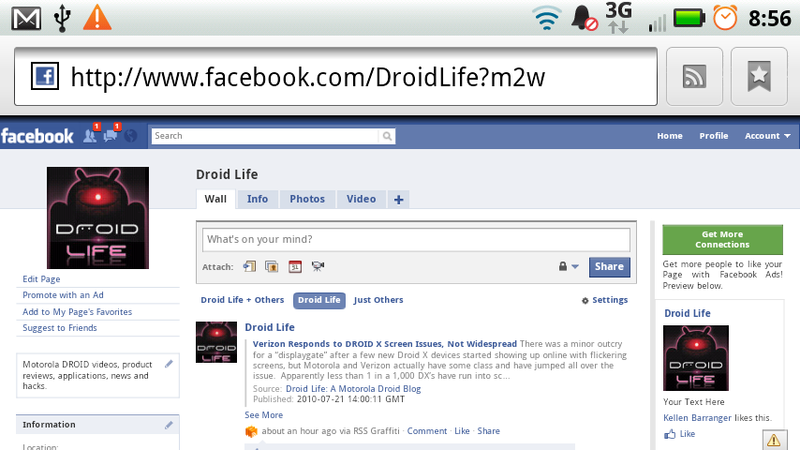 On your Droid X, navigate to whichever screen you wish to take a screen shot of. 13. 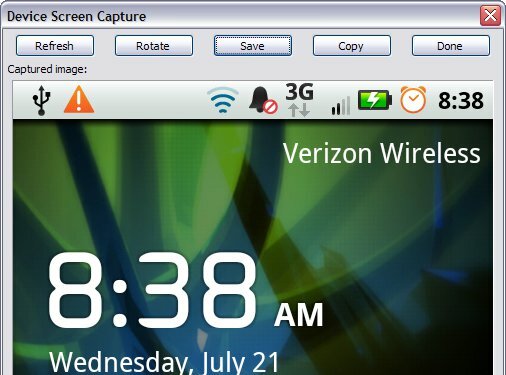 Choose “Device” and “Screen Capture” in DDMS. 13. DDMS will take a screen shot and let you preview it. 14. Click “Save” or any other option you wish and you have officially taken your first screen shot! BAM! And feel free to share any of your fabulous screenies. I’d love to see how everyone rolls with a screen shot of your desktops. Enjoy!